Home Insurance – Are You Properly Covered? Home » Blog » Home Insurance – Are You Properly Covered? Home insurance seems like one more expense each month, stretching the budget with no tangible product to show for the money. However, adequate insurance cover is always very much appreciated in the event that it is needed, and no one who has to claim on their insurance ever wishes that they had a lower level of cover. Hamilton King Management, a specialist property management company devoted to delivering quality estate management to all clients, explains how to make sure that you have appropriate insurance for your property. There are two parts to this, although they are often bundled together. You can buy one part, or the other, or both. Buildings insurance insures your actual bricks and mortar from damage caused by events such as fire and extreme weather. If you have a mortgage on your property, the mortgage lender will probably insist that you have buildings insurance. Contents insurance insures your possessions against events such as theft and water damage. There are two types of buildings insurance – bedroom-rated and sum insured. Bedroom-rated is the most common form of buildings insurance these days. It means that the insurance company uses the number of bedrooms in your house to work out how much it might cost to rebuild. Cover levels tend to be generous, but you should still check the sum assured (the amount you might be paid if your house were to be destroyed) against a recent property valuation or against the value for which properties similar to yours are being sold in your area. With sum assured insurance, you calculate the value of rebuilding your home yourself, and insure for this amount. You may need to use a surveyor for this, unless you are an expert. It is important that the sum assured is correct. If it is too low, then if your house were to be destroyed, you might not get enough money to rebuild it. Conversely if the sum assured is too high, you may be paying too high a premium, and in the event of a claim it may look suspicious if you are claiming more than the cost of rebuilding. It is a good idea to review the level of cover each year at the policy’s renewal. It is often hard to decide what to include on a contents insurance policy; in general, if it is something that you would take with you if you moved house, then you should insure it. However, you should also remember to include the value of your carpet and curtains. These policies also can work on a sum insured or a bedroom-rated basis – if you do not want to list all your possessions for ‘sum insured’ cover, the insurance company will estimate the level of cover you require from the number of bedrooms. 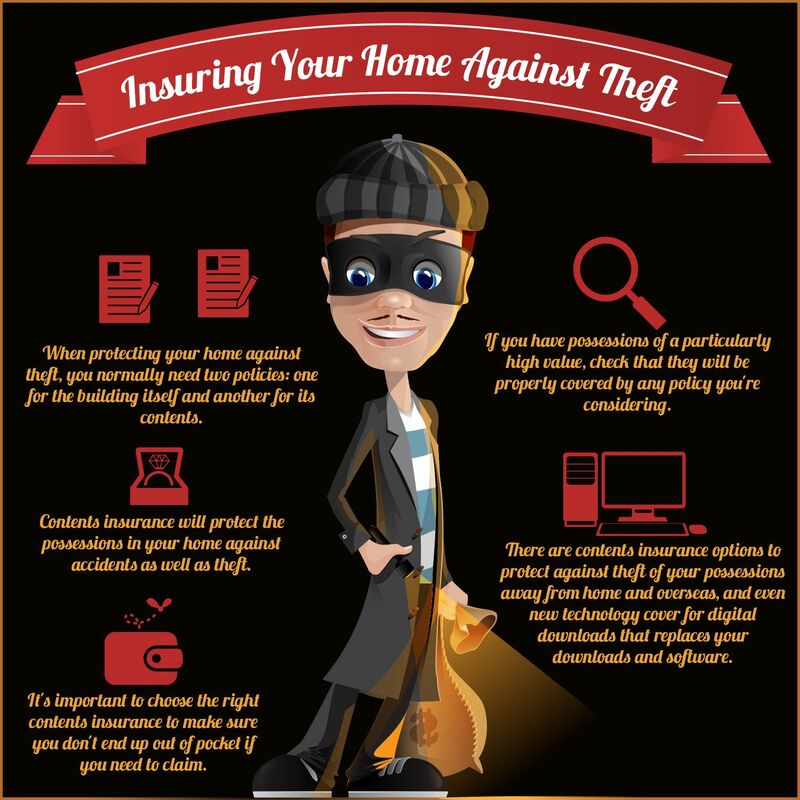 Contents insurance isn’t just to protect you against theft. In the unfortunate event of a fire, everything in your house could be destroyed, and you might have to replace all your possessions. Nowadays, there are many comparison sites available online, so that you can quickly compare policies. Remember that you aren’t just comparing price – you are comparing what each policy covers. For buildings insurance, check which events are covered, and which are excluded. For example, if your house was destroyed, would the policy pay for alternative accommodation, and if so, for how long? For contents insurance, check whether the cover is suitable – for example, would your bicycle or laptop be covered if it was stolen when away from the house? Do you have to have a particular sort of lock fitted to your house for your insurance to be valid? There is often a cover limit for individual items, so this may not be adequate for high value items. If your items don’t have sufficient cover, you may have to insure them separately. Check whether your insurer has any special requirements – for example, they might wish you to send photographs of them or receipts. The excess on a policy is the amount that you would have to pay if you made a claim. If the excess on your policy is £100, you would have to pay the first £100 of any claim. Choosing a higher excess means that your monthly premiums will be lower; however, you should be certain that you would be happy to pay the excess if you had to make a claim. When completing the application form for your insurance cover, it is very important that you are totally honest with the insurer and disclose all material facts to them. You might invalidate your policy or the insurance company may not pay a claim if they discover that you have not been honest – even if the issue which you have not disclosed has no bearing on the claim. A little bit of time spent making sure that you have the right insurance cover could give you great peace of mind as you will know that your home and your possessions are properly protected.